Internet access: Access websites through a web browser on your phone. Photos: The Galaxy S8 comes with a very intelligent camera that has millions of combinations of settings, filters, and resolutions and also has the capability to manage photos. Wireless email: Send and receive email from your phone. Multimedia: Play music and videos on your phone. Contact Manager: The Galaxy S8 lets you take shortcuts that save you from having to enter someone’s ten-digit number each time you want to call or text a friend. In fact, the Contact Manager can track all the numbers that an individual might have, store an email address and photo for the person, and synchronize with the program you use for managing contacts on both your personal and work PCs! Digital camcorder: The Galaxy S8 comes with a built-in digital camcorder that records live video at a resolution that you can set, including 4K/UHD (ultra-high definition, which is just now available on the newest televisions). Mapping and directions: The Galaxy S8 uses GPS (Global Positioning System) along with other complementary positioning systems to tell you where you are, find local services that you need, and give you directions to where you want to go. Fitness information: The Galaxy S8 automatically tracks important health information within the phone and with external sensors. Business applications: The Galaxy S8 can keep you productive while you’re away from the office. Until a few years ago, the only way to access the Internet when you were away from a desk was with a laptop. Smartphones are a great alternative to laptops because they’re small, convenient, and ready to launch their web browsers right away. Even more important, when you have a smartphone, you can access the Internet wherever you are — whether Wi-Fi is available or not. The drawback to smartphones, however, is that their screen size is smaller than that of even the most basic laptop. On the Galaxy S8 phone, you can use the standard version of a website if you want. You can pinch and stretch your way to get the information you want. To make things a bit easier, many popular websites offer an easier-to-use app that you can download and install on your phone. Essentially, the website reformats the information from the site so that it’s easier to read and navigate in the mobile environment. The following figure compares a regular website with the app version of that website. 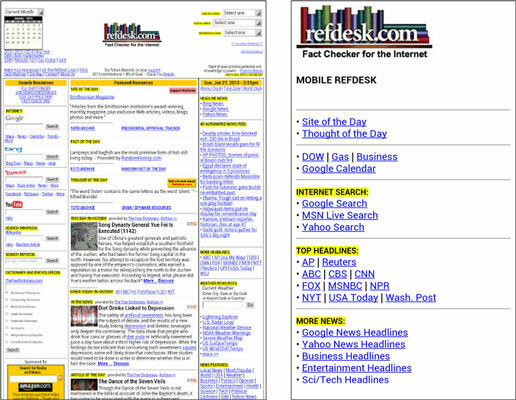 A website and the app version of the main site. Studies have found that cellphone users tend to snap a bunch of pictures within the first month of phone usage. After that, the photos sit on the phone (instead of being downloaded to a computer), and the picture-taking rate drops dramatically. The Galaxy S8 image management application is different. You can integrate your camera images into your home photo library, as well as photo-sharing sites such as Google Photos and Flickr, with minimal effort. On your Galaxy S8 smartphone, you can access your business and personal email accounts, reading and sending email messages on the go. Depending on your email system, you might be able to sync so that when you delete an email on your phone, the email is deleted on your computer at the same time so that you don’t have to read the same messages on your phone and your computer. Some smartphones allow you to play music and videos on your phone in place of a dedicated MP3 or video player. On the Galaxy S8, you can use the applications that come with the phone, or you can download applications that offer these capabilities from the Play Store. Samsung’s intelligent agent is called Bixby. You simply ask Bixby to take care of things for you, such as update an appointment or check for prices and Bixby will go off and do it. Application developers — large and small — are working on the Android platform to offer a variety of applications and games for the Galaxy S8 phone. Compared to most of the other smartphone platforms, Google imposes fewer restrictions on application developers regarding what’s allowable. This freedom to develop resonates with many developers — resulting in a bonanza of application development on this platform. As of this writing, almost two million applications are available from Google’s Play Store. For more information about downloading games and applications. Although your phone comes with a few general-interest games, you can find a whole wide world of games for every skill and taste. Whether you prefer stand-alone games or multiplayer games, you can set up your Galaxy S8 phone to get what you need. Your phone also comes with preloaded widgets, which are smaller applications that serve particular purposes, such as retrieving particular stock quotes or telling you how your phone’s battery is feeling today. Widgets reside on the extended Home screen and are instantly available. Buying applications allows you to get additional capabilities quickly, easily, and inexpensively. Ultimately, these make your phone, which is already a reflection of who you are, even more personal as you add more capabilities. The Samsung Galaxy S8 is the top-of-the-line Android phone. That means you can run any application developed for an Android phone to its full capability. This is significant because one of the founding principles behind the Android platform is to create an environment where application developers can be as creative as possible without an oppressive organization dictating what can and cannot be sold (as long as it’s within the law, of course). This creative elbow room has inspired many of the best application developers to go with Android first. In addition, Android is designed to run multiple applications at once. Other smartphone platforms have added this capability, but Android is designed to let you to jump quickly among the multiple apps that you’re running — which makes your smartphone experience that much smoother.